Plant based milk is an alternative to dairy milk which is made from plants such as almond milk, soy milk and coconut milk. Plant based milk is generally for the people with medical issues or lactose intolerance but some people also opt this for lifestyle reasons or for better living standards. Plant based milk products are full of nutrients like protein, fat, vitamins and carbohydrates etc. According to National Institute of Children's Health & Human Development, in the U.S. around 30-50 million people are lactose intolerant. Goldstein Research analyst forecast the plant based milk market size is set to reach USD 19.54 billion by 2024, at a growing CAGR of 10.4% over the forecast years. Due to increase in number of health conscious consumers, the plant based milk market is expected to rise over the forecast period. In addition, due to rising awareness about gastrointestinal diseases and stomach flues which are caused due to dairy products will increase the plant based milk market. The report covers the present ground scenario and the future growth prospects of the plant based milk market for 2016-2024 along with the increase of lactose intolerant population, availability of large quantity of the products and their shipment data. We calculated the market size and revenue share on the basis of revenue generated from major players across the globe. On the basis of product type, almond milk is having the highest market share of 40.0% and is the first preference of the consumers due to its health benefits, great taste and variety of flavors available in the market. Whereas, on the other hand the market share of soy milk is growing steadily at a market share of 29.0% because of the low fat concentration and flavors. Soy Milk is estimated to account for the highest share of the plant based milk market in 2018. 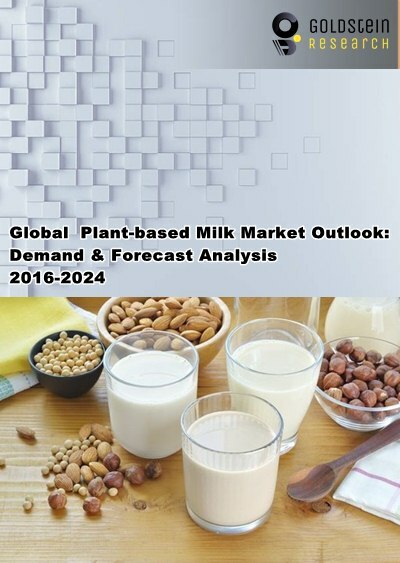 Plant based milk market Outlook 2016-2024, has been prepared based on an in-depth market analysis from industry experts. The report covers the competitive landscape and current position of major players in the global plant based milk market. The report also includes porter’s five force model, SWOT analysis, company profiling, business strategies of market players and their business models. Global Plant Based Milk Market report also recognizes value chain analysis to understand the cost differentiation to provide competitive advantage to the existing and new entry players. Our global plant based milk market report comprises of the following companies as the key players: Ripple Foods, Danone, WhiteWave Foods, Archer-Daniels-Midland, Hain Celestial Group, Califia Farms, Daiya Foods and Freedom Foods. Other high-flying vendors in the market are: REAM, Malk Organic, The New Barn, Grace Foods and Pureharvest etc. According to the report, major driving factor for plant based milk market is the launch of the sophisticated flavors and mixtures of plant based milk from different sources. Different flavors of soy milk and other plant based milk are available and rising in the promotional campaigns by major players are driving the growth of the plant based milk market. Further, the report states the major challenge is the nutritional disadvantage because of the added sugar content which increases the calories without offering nutritional value and increases the risk of cardiovascular disease. Some of the plant based milk products are relatively low in proteins, calcium or Vitamin D which is important for skin health and contains low level of arsenic which is not suitable to children. Based on geography, Asia Pacific region dominated the global plant based milk market with the market share of 45% in 2016. China, Japan, Taiwan and Singapore are the major countries in the plant based milk market because of the increase demand in the lactose free milk, veganism and urbanization. North America and Europe are growing steadily with the market share of 32.7% due to the rise in milk allergies, growing caution over hormones and antibiotics in dairy. More than 1.5 million Americans over the age of 17 have adopted the vegan diet. What is the total market size of plant based milk market by 2024 and what would be the expected growth rate of the market? What is the revenue of plant milk market in 2015-16 and what would be the expected demand over the forecast period?